Jinhee Park (below) created a house (top) in Lexington made mostly out of Central Artery demolition rubbish. What's it like to be a young architect trying to make a career in Boston? Architects, like symphony conductors, tend to flourish in their later years, not when they're young. Buildings are expensive, and their sponsors don't always want to bet big money on unknown talents. And a lot of the talented graduates of Boston-area architecture schools don't stay here. They decamp to New York or elsewhere, places perceived as being more welcoming to youth and innovation. We'll take as a case study one very gifted but otherwise not untypical Cambridge architect named Jinhee Park. Park - her first name is pronounced like the English Ginny - has just won an award as one of the eight outstanding young architects in the United States for 2009. The prize is called the Young Architects Award, and it's given by the American Institute of Architects, which says it "recognizes individuals who have demonstrated exceptional leadership and made significant contributions to the profession earlier in their careers." If you can believe this award, Boston is now home to one fourth of the outstanding young architectural talent in the country. Another local, Haril Pandya, is also one of those eight national winners. Pandya, who works at the large firm CBT, was cited for his leadership and marketing skills. As for Park, her nomination states that she "is one of those young architects whose contributions and skills will shape our profession for decades to come." 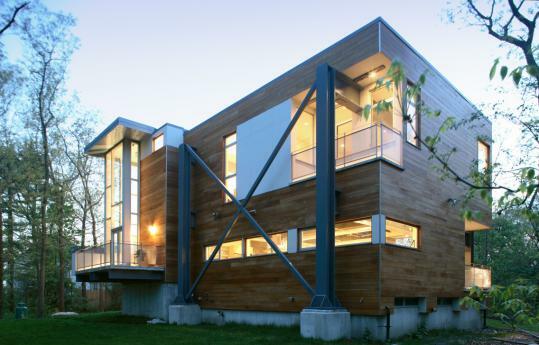 She first became known for an amazing project, completed in 2006, in which she and a partner created a house in Lexington made mostly out of discarded demolition rubbish from the old Central Artery, which was then being torn down for the Big Dig. The house is delightful and livable, but with its bold steel framing it also retains a sense of the drama and power of the Artery. That sense of a recycled world is part of its charm. Park, 35, is typical of her generation in that she's an example of the globalism of today's world of architecture. She was born in Korea, where she studied industrial design. (Hong's parents are Korean too.) Then she got a degree in architecture at Harvard's Graduate School of Design, where Hong was also a student. She has worked or taught in the United States, Japan, Ecuador, and Spain. At this writing, she's back in Seoul, hoping to open an SsD branch office there. "The American dollar is still strong in Korea," she says by phone. "We think we can work more economically there. And we think there are more opportunities for sustainable design. We're hoping to find another firm there with whom we can share employees." Park is, in a sense, outsourcing herself in the global economy. Further expanding their tiny empire (SsD currently consists only of Park, Hong, and two employees), the partners also recently opened an office in New York. "We hope to get fewer but bigger projects there," says Park. To help finance it, they sold an apartment they owned in Cambridge and now survive, says Hong, "in a makeshift attic above the Cambridge office." Like other creative young architects, the partners survive partly by teaching. 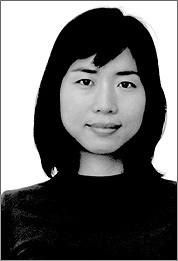 Hong teaches at the Harvard design school. Park's most recent slots have been at the Illinois Institute of Technology and the University of Houston. Not to say that they're starved for work. One fascinating project is a house in a place called Ordos in Mongolia. (Little-known young Cambridge architects working in Northern Asia? Globalism, again.) A Chinese developer came up with the idea of building a community of 100 houses, each to be designed by a different architect. All 100 architects - mostly Americans and Europeans - met in Mongolia, where they discussed how best to achieve energy savings so as to create a model community. Park's contribution to Ordos is striking. It begins as a single dwelling on the ground, but then, as it rises, it gradually divides into eight towers, each of which enjoys a private roof-top patio. "We were looking for flexibility," says Park. "They asked us for a single house of 10,000 square feet. We thought that was too big, so we designed a house you can divide up into several separate dwellings for different occupants at different times. Or, if one family lives there, they can easily shut off heating and cooling for rooms that aren't being used at particular times of day or seasons." She doesn't mention aesthetics, but the house is a stunning sight visually, resembling a tiny village of white towers. It's on track to begin construction this fall. That kind of flexibility is an SsD nostrum. Another current project is a building in a wealthy neighborhood of New York. "We took photographs of the neighborhood at night," says Hong. "We found that many apartment windows are dark for weeks at a time. They're not being occupied full time by families. They're pieds-a-terre for global people who use them for only a few days or weeks at a time. It's the same in Seoul. "So we thought, why put these people in apartments intended for families? They don't fit. So we tried to create spaces that can be subdivided in many different ways for different sizes and styles of living." Semi-transparent sliding walls are part of the ingenious solution, shaping spaces that seem to move and interact with the user. Park and Hong believe in staying small. "For a while we took on ordinary developer housing here in Cambridge," says Hong. "But we found we couldn't experiment with that kind of work." Park adds, "We're not achieving our goals. Our projects should be more prototypical, they should be solutions to important problems. What kind of experiment? Besides flexibility, what the partners care most about is sustainability, meaning architecture that can endure without being constantly pumped full of energy. But they don't want to accomplish that goal by layering a building with high-tech appendages, such as solar panels. They think sustainability should run deeper. It should begin with decisions about where and how to site the building and with the choice of materials. They're looking, they say, for "environmental performance." "We like to use low-tech materials in a low-energy way," is how Hong puts it. He calls it "a new minimalism." The Big Dig house, by its recycling of ordinary materials, was an early move in a consistent philosophy. Another of my favorite SsD projects is the ultimate in low-tech architecture. It did not, alas, get built. This was a redesign of the lobby of the Massachusetts College of Art and Design, with new walls and seating finished entirely in used seat belts. Seat belts take a thousand years to bio-degrade if you just throw them out, according to the architects. The seemingly banal material would, in fact, have created surprising Op Art patterns in the walls. Seat belts? Isn't that the world of frugal recycling that we are now entering? Why not have fun with it?